This Hugo-nominated novella adds a delightful extra chapter to Bujold’s Vorkosigan series, describing the wedding of Miles and Ekaterin and events leading up to it. In the festive season of Winterfair on the planet Barrayar, Lord Miles Vorkosigan is making elaborate preparations for his wedding. The long-awaited event stirs up romance and intrigue among his eccentric family and friends, particularly for bioengineered space mercenary Sergeant Taura and shy, diffident Armsman Roic. But Miles also has an enemy who is plotting to turn the romantic ceremony into a festival of death. I generally like most of the things I read. This is probably because I pick what I’m going to read fairly carefully. It’s rare when I sit down with an a book and it isn’t something I’ve already read something about. One of the things that tends to keep me away from a book is an excessive length. I find far too much of today’s fiction overly wordy. I want the ideas in the book, the experiences, I don’t need to see it hit a certain pagecount. The style of the moment is to go long. Often this leads to entirely pointless writing within a story. It’s like I’m Paul Newman in Fat Man And Little Boy. My mantra is: “Just give it to me.” Give me the story – don’t flower it up or string it out. Just give me the bloody story! Lois McMaster Bujold doesn’t bloat out her stories. This audiobook, a novella, is a good example of that economy. Sure it’s part of a series, but it can and does stand alone. The story is slowly paced, but not slow to read. Readers, like me, who haven’t been oh-so-carefully following the Miles Vorkosigan adventures can still follow the story of any particular novel (or novella) and enjoy it for what it is – a good read. Those who have been following along carefully, and who pick up on some of the timeline and character clues, will probably get an extra bit of enjoyment out of it. Bujold is one of the few female SF authors I have no problem reading. This is despite her coming at SF from what I see as a very female point of view. Emotion, humor and romance are key for Bujold. Character, something I usually don’t care that much about, is also one of Bujold’s major strengths. In this novella, we get two minor Vorkosigan players meeting and working together for the first time. Its mostly a character piece – with the mechanics of the crime and the science fictional elements taking a serious back seat to a budding romance. It’s the same sort of work/romance thing you get in Bones and Moonlighting. Nobody enjoys those stories for the groundbreaking writing. Now that may sound like I’m damning Winterfair Gifts with faint praise. I’m really not. 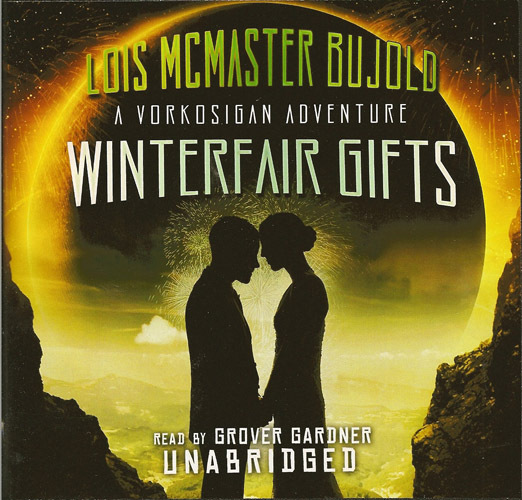 Winterfair Gifts is fun, skillful storytelling set in an SF universe. This is a gentle romance with a bittersweet twist. A romance story dudes can enjoy. 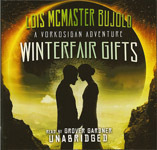 Bujold is a fine writer and Winterfair Gifts is a damn fine audiobook. Consider this fresh series as an alternative to the increasingly devalued Dune series. Sergeant Taura and Armsman Roic, two trusted members of the extended Vorkosigan security services (and everyone else in this book) are voiced by veteran narrator Grover Gardner. Gardner is one of the old school narrators who long time audiobook fans just love to listen to. His voice is rather odd, almost sounding artificial – but not at all in a bad way. Audiofile Magazine has a quote describing his voice as “sandpaper and velvet” – which really doesn’t tell you much – unless you’ve heard his voice. 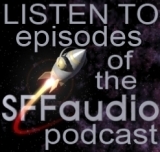 He’s a skilled narrator and is well chosen for the Vorkosigan saga.